Once it powers on, you will need to configure your iPad by going into Settings, the vSphere client (usually bottom left corner of screen, in the Apps section), then you enter the IP address of your mobile appliance. Finally, you can access your environment from the vSphere iPad app by entering your vCenter server info or ESX server info, with appropriate username and password. Having a heads-up from the vExpert team briefing by Srinivas Krishnamurti, Sr. Director for Mobile Solutions and Marketing at VMware, plus earlier press coverage from VMworld 2010 (see below), I knew what this “information leak” was hailing. Fortunately, the offending section (text above) was quickly redacted and VMware managed to avoid spoiling the surprise pending today’s [press release]. This grouping of action/command definitions identify 17 of 23 vCMA action classes. These classes meant four things to me: (1) the actions are tuned specifically for a non-HTML-only client; (2) the limitations of vCMA’s web interface do not bind the iPad client; (3) there is significant potential for “capabilities drift” between the iPad client the “generic” mobile access client (i.e. HTML) as time goes by (read: richer feature set, user options); and (4) other “tablet” or “mobile” clients can’t be too far behind. Today, VMware CIO Steve Herrod announced the launch of version 1.0 of the vSphere Client for iPad (vCiP). The aptly named utility runs on Apple’s current generations of iPad and provides access to many of the basic administrative functions available to vCenter and the standard vSphere Client. This release must be seen as a quick, 1-2-3 punch of mobile and management-centric releases for VMware in the span of two weeks: vCenter Ops, View Client for iPad and now vSphere Client for iPad. This iPad application is not truly a “native” or “fat” client for vSphere in the “conventional Windows sense.” Instead, VMware’s new app deploys as a web service reliant application (typical of its iPad ilk), and it is accordingly “small, light and elegant.” As you might guess from the [leading] introduction, the “heavy lifting” is actually performed by VMware’s vCenter Mobile Access (vCMA) appliance through the set of new classes (conveniently listed above). VMware diagram showing (optional) placement of firewall, vCMA, vCenter and vSphere clusters. The use of a VPN connection to your firewall is strongly recommended as vCMA deploys with its web service without SSL enabled. This illustration depicts the “best practice” recommended deployment for the iPad client by way of a trusted VPN connection. Again, this information was provided to us from Srinivas and his team “pre-launch” and hence was also prior to the recently released enhancements in vCMA (see below). In either case, the connection from iPad to vCenter is always translated through vCMA. The password for the vSphere user. The IP address or DNS host name for your vCMA appliance (displayed as “Web Server” in “Settings”). vCMA’s web service is not SSL encrypted, and these credentials could be passed “in the clear.” (see updated post, SSL added to vCMA this Tuesday.) Given this client is targeted for mobile use, the risk of exposure to insecure networks (Internet, public WiFi, etc) without SSL would have created “special” opportunities for man-in-the-middle attacks. However, the use of a mobile VPN connection for the iPad client is strongly recommended, but no longer strictly necessary. I think “launched” is a good description of a product that represents a company’s first release from a product acquisition that was already somewhat mature. No surprising new features, no trend-setting advanced in interface or integration – just a solid, usable “pane of glass” to improve “visibility” into an existing product set. That’s how I’d describe VMware’s “new” vCenter Operations appliance for vSphere. If you’re like me, that description won’t make you find a place in your strained IT budget for VMware’s new plug-in. Eventually, VMware will find the right messaging to sell this add-on, but let’s see if it can sell itself, shall we? Located deep within a “related whitepaper” there is an indication of how vCOPS differentiates itself from the crowd of “pretty statistics loggers” and delivers some real tasty goodness. I believe this is the real reason why VMware shelled-out $100M for the technology. Yeah, I thought that too. What the heck is a “dynamic threshold” and why do I care? For one thing, it takes VMware two pages of white paper just to describe what a “dynamic threshold” is, let alone describe how it adds value to vCenter. 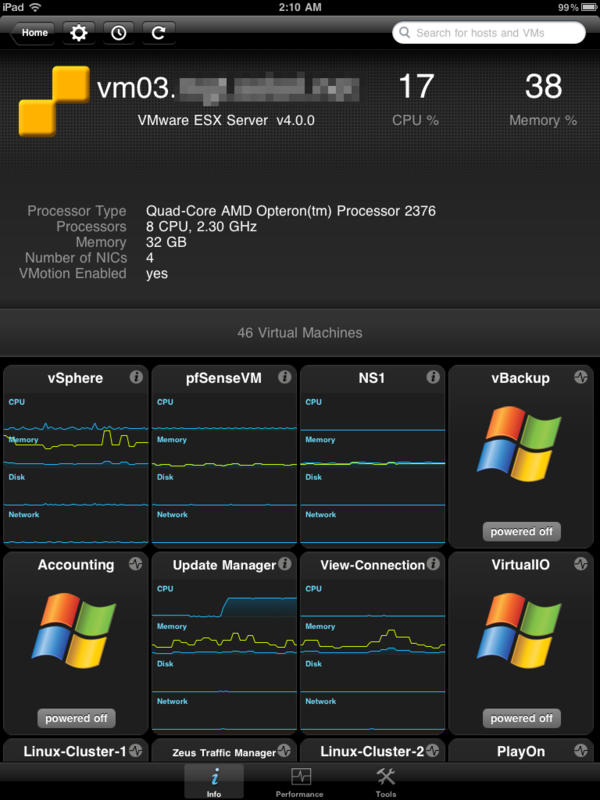 In short, VMware’s statistics logger applies eight proprietary algorithms to live and historical data to “predict” what “normal” operating parameters are for a specific VM, host, cluster, etc. and then make decisions as to whether or not anomalous conditions exist in the present operating state. 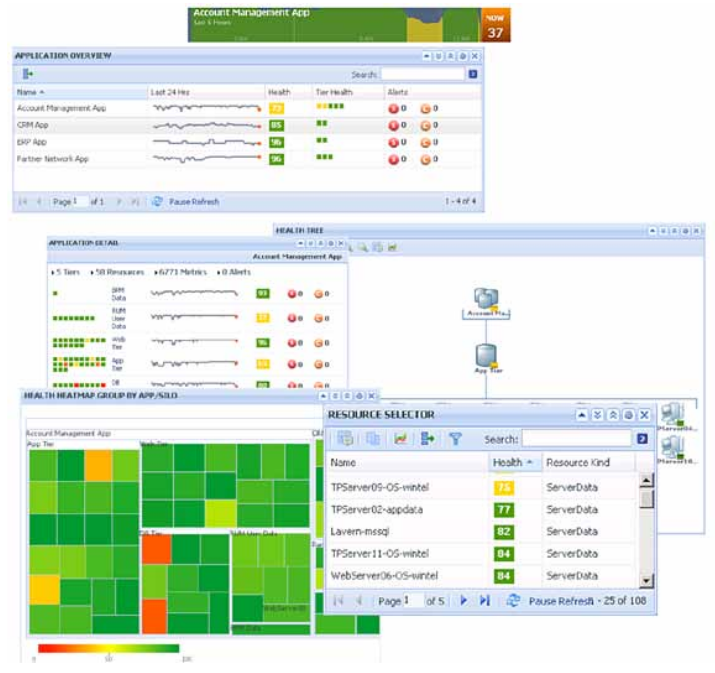 vCenter Operations' stats engine tries to see performance data as a seasoned admin would. Effectively, VMware’s dynamic threshold takes a sophisticated look at the current trend data just like a seasoned IT admin would – except it does it across your entire virtual enterprise every 12 hours and predicts what the next 12 hours should look like. This “prediction” becomes the performance envelope, hour by hour, for the next 12 hours of operation. So long as your virtual object’s performance stays within the envelope, the likelihood of anomalous behaviour is low; however, when it is operating outside the envelope, outliers are likely to trigger performance alarms. • An algorithm that can detect linear behaviour patterns (e.g., disk utilization, etc.). • An algorithm that can detect metrics that have only two states (e.g., availability measurements). • An algorithm that can detect metrics that have a discrete set of values, not a “range” of values, (e.g., “Number of DB User Connections,” “Number of Active JMVs,” etc.). Anomaly count comparison across separate tiers. 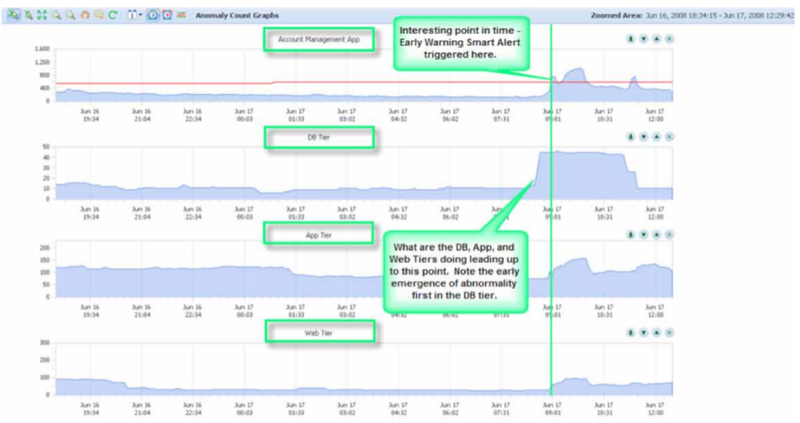 Note "smart alert" gets triggered early in the process (Enterprise Edition). Do Fries Come with That? From some of the back-peddling overheard in the vExpert pre-launch conference, VMware’s testing the waters on where the product fits at the low-end. Essentially, this is an enterprise class product offering that’s been paired-down to fit into a smaller IT budget. Like most VMware products, a generous “free” trial period will be granted to allow you to try before you buy. However, the introductory price (i.e. official pricing is not posted on VMware’s site) is set at $50/VM (hence Kendrick’s quandary) for up to 500 VMs (about $25K). Since VMware intends to offer an inclusive pricing scheme, all registered VMs will need to be licensed into the Standard Edition’s footprint. In the vExpert call, there was “talk” about extending analysis only to specific VMs (and allowing for a paired-down licensing footprint) but that is conjecture today. In a typical enterprise where 70-80% of workloads are non-mission critical, the cost and license model for vCOPS could be an obstacle for some – or at least force the use of a separate vCenter and cluster arrangement. 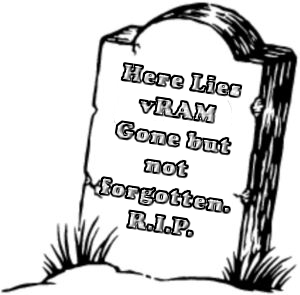 Let’s hope VMware comes-up with a mission-critical license model quickly. Last November we reported on the Fujitsu RX300 S5 rack server taking the top VMmark spot for 8-core systems. Yesterday (January 11, 2010) Cisco’s UCS B200-M1 using VMware ESX 4.0 (build 164009) came within 0.5% of the top spot with a score of 25.06@17 tiles. While falling only slightly short of the mark set by the brute force RX300/DX80 combo, the UCS system did so with a very different solution, unsurprisingly similar to the vBlock Type 1 architecture described by Chad Sakacc in his blog post about the VMware, Cisco and EMC alliance. Given that VMmark is a single node test harness, the difference between rack server and blade server architectures is a non-issue. However, more than just rack vs. blade is going on in this comparison. The Cisco UCS system is being fed by a pair of 10GE converged network adapters – used both for host network access and Fiber Channel bus access – and a monolithic storage array in the guise of a CLARiiON CX4-240 complete with a complement of 20, 73GB STEC SSD’s – just to sweeten the pot. Given the ease at which RAID0 can be replaced by RAID1+0, it may be safe to assume that the same results could have been obtained by using 77 disks instead of 41 – at which point the CX4-240 would still be less than half the size of the top VMmark’s 172-disk solution. The reason is clear: SSD’s accelerate I/O loads incredibly well in architectures that support them. If anything, this “runner-up” proves that SSD adoption is on the verge of becoming mainstream. But what does this test show about UCS? Firstly, it shows that Cisco’s platform can compete with the best solutions out there on CPU and I/O performance (what’s a half a percentage point across 102 virtual machines?) It’s not really a surprise given that the UCS platform was designed to do just that – and within a neatly managed framework. 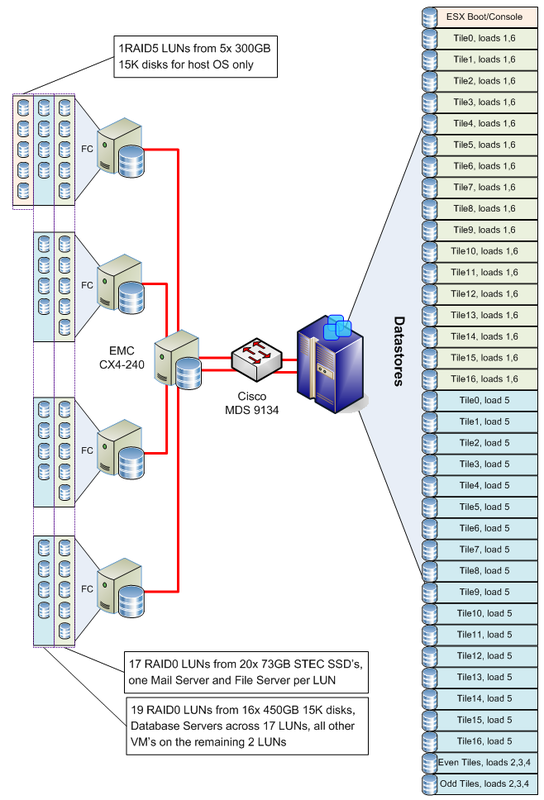 Secondly, it shows that the choice of EMC as a partner was an excellent one. As Martin Glassborow commented on his Storagebod’s Blog, EMC’s involvement in VMware has energized the storage vendor to take bold and innovative steps towards Cloud Computing solutions that it might not have done otherwise (like the RAID0 SSD array). 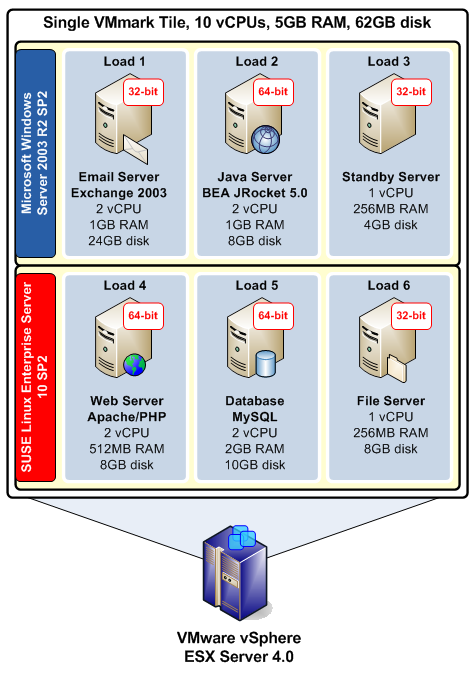 Thirdly and most importantly, it underscores the importance of predictable performance in a virtualization solution. Given the UCS/vBlock approach to systems organization, it can be very difficult not to draw solid parallels between the benchmarks and expectations for net new builds based on the criterion. VMworld 2009 in San Franciso started off with a crash and a fist fight, but ended without further incident. 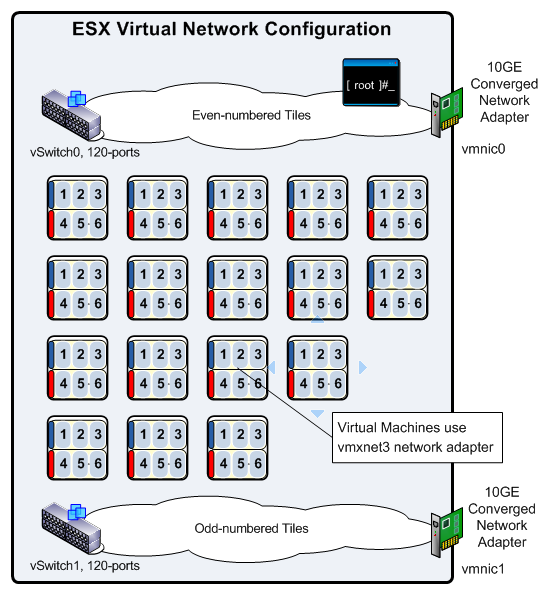 If you’re looking for what happened, it would be hard to beat Duncan Epping’s link-summary of the San Francisco VMworld 2009 at Yellow-Bricks, so we won’t even try. Likewise, Chad Sakacc has some great EMC view point on his Virtualgeek blog, and – fresh from his new book release – Scott Lowe has some great detail about the VMworld keynotes, events and sessions he attended. There is a great no-spin commentary on VMworld’s “softer underbelly” on Jon William Toigo’s Drunken Data blog – especially the post about Xsigo’s participation in VMworld 2009. Also, Brian Madden has a great wrap-up video of of interviews from the VMworld floor including VMware’s Client Virtualization Platform (CVP) and the software implementation of Teradici’s PC-over-IP. SOLORI’s Take: The controversy surrounding VMware’s “focus” on the VMware “sphere” of products was a non-starter. The name VMworld does not stand for “Virtualization World” – it stands for “VMware World” and denying competitor’s “marketing access” to that venue seems like a reasonable restriction. While it may seem like a strong-arm tactic to some, insisting that vendors/partners are there “for VMworld only” – and hence restricting cross-marketing efforts in and around the venue – makes it more difficult for direct competitors to play the “NASCAR-style marketing” (as Toigo calls it) game. VMworld is a showcase for technologies driving the virtualization eco-system as seen from VMware’s perspective. While there are a growing number of competitors for virtualization mind-share, VMware’s pace and vision – to date – has been driven by careful observation of use-case more so than innovation for innovation’s sake. It is this attention to business need that has made VMware successful and what defines VMworld’s focus – and it is in that light that VMworld 2009 looks like a great success.